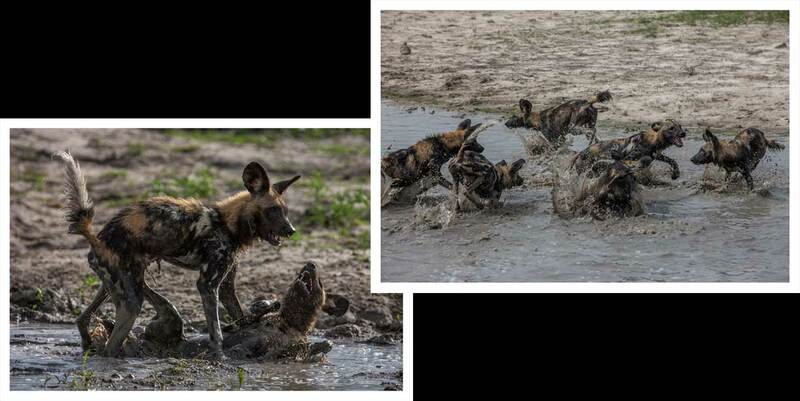 At the height of the rainy season in the Okavango Delta, conditions are ideal for wild dogs - the latest litter of pups are of a size that they no longer need constant attention, they are curious, and full of playful energy. The acacia woodland where they prefer to hunt has water-filled pans and is crammed full of potential prey. We sat with the Chitabe pack for 4 hours while they chased, frolicked and played in the rain-filled pans. Pups ganged up on adults; they dunked, nipped and harassed a particular pup until that pup decided enough was enough and then the tables were turned onto another pup and the frenetic harassment continued. Card after card of shots was filled with high action drama as the pups tried hard to gain dominance over one another. Any amount of time spend with dogs should be considered a privilege.